The existence of fake MAC products being sold through online auction websites was initially bought to my attention though Pretty Pretty Pretty. It struck a chord with me as I have considered purchasing discounted MAC eyeshadows off of Trade Me (NZ online auction website) in the past. However, this problem is not restricted to New Zealand and I wanted to raise awareness of how to spot a fake MAC product to prevent more buyers being duped. Not everyone things this is a problem, and report that the fakes are not always of band quality. The risk is that you have no idea about what is in this cosmetic, how it was made, and where it’s from. Ingredients found in fake cosmetics have ranged from coal tar to phthalate, and those are dangerous additives. You do not know what black market activities profit from producing fakes is being funneled into, and of course it is illegal. 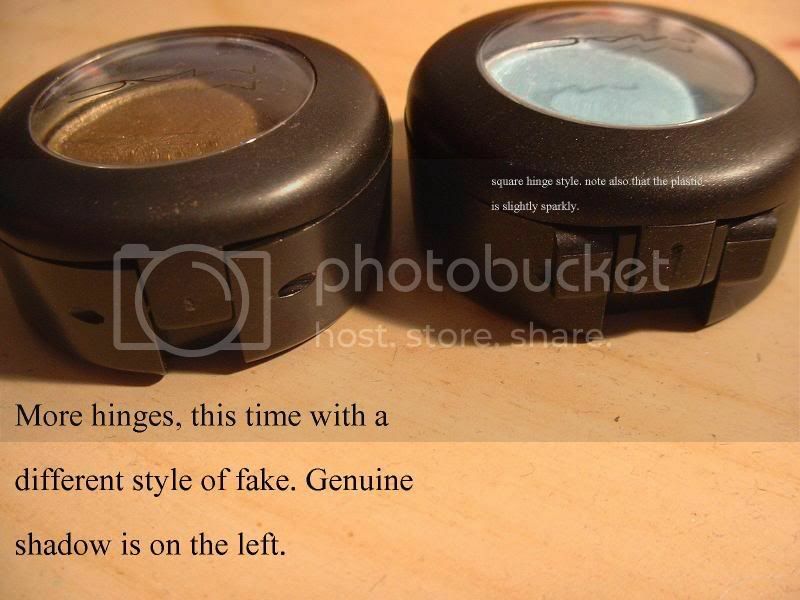 For your benefit, I am going to explain how to spot fake MAC eyeshadow and pigment products. 1. Look at the sticker on the base of the eyeshadow. The sticker should be labeled with the name of the eyeshadow, MAC always names their eyeshadows. Fake eyeshadows will often only label the stickers with number/letter codes. 2. MAC eyeshadows should not have a screw top. I have heard of older eyeshadows have screw tops, but none of the recent products. MAC eyeshadows should have a flip top, and the hinging should look like this. 3. The glass window should not have a thick rim around the outside, it should be evenly clear across the entire panel. 4. The logo should be printed in a clear font, and the lines detailing the word ‘MAC’ should be relatively thin. Fake MAC products often print logos with thicker lines. 5. Authentic MAC eyeshadow do not come with a sponge applicator and mirror. The compartment should not lift up to expose either of these features and if your product does this then it is definitely fake. 2. Watch out for pigment colors listed as “rare,” as these are often fakes. 3. On the bottom of the box there should be a bar code label printed on a sticker. If the bar code is printed directly onto the bottom of the box then the product is a fake. 4. There should be a black round sticker on the top right hand corner of the box with the name of the color on it. Fake pigments often place the sticker closer to the front. 5. The pigment jar should have a small circle sticker on the bottom, and that sticker should have the colors name printed on it. Above the name of the pigment there should be a name and number code, fake MAC pigments are known to only have the numbers and not the color name. 6. The pigment itself should be sealed by a protective lid. There should not be a hole in the middle to pour the pigment from. 7. Fake MAC pigment is not the same high quality of authentic MAC pigment. While the authentic product will leave a rich and vibrant color on your skin with just a little, the fakes are often dull and rubs off easily. MAC pigment should not rub off easily. When buying cosmetics online, buyer beware! Look out for luxury goods at cheap prices. Be smart and Google how to spot a fake of the particular product you are purchasing before you make a decision.